Cool! Thanks for posting this. I just now ordered your PIR project boards from Osh Park. Hopefully they'll arrive in two weeks, around the time that my AM612 PIR sensors arrive from China (e-packet delivery). Any chance you may have the rest of the project details posted by then as well? Your project write-ups are always excellent. You should have waited a bit for me to test the PCBs, it's never been tested that's why I didn't put any detailed instructions yet. I don't mind sharing the risk. Did you run schematic verification on the PCB? In Diptrace, it's one of the simple tests that can be run to ensure that the PCB does correspond to the original schematic, and I presume Eagle has it as well. If ithe board passed that test, then I'm not overly worried. I don't see the reason of such a test ? Schematic and board/pcb are linked in Eagle, everything I add in schematic is created on the board/pcb also. I just have to make sure all expected connections have a trace (no more "airwires") and make a design rules check to make sure I respect the rules set for PCB manufacturing. So yes I did that but I could have made a mistake in the footprint or made a wrong connection on the schematic, some of the PCBs were finished late at night so there's a high probability to have a failure or two in the 8 shields. Understood. In that case I'll make a barebones breakout board for the AM612 as a "Plan B". I figure the odds are good that at least one of our two boards should work! So I made a test for the basic functionality of this shield (with 2s ontime and max sensitivity) and it works, but as I said in the other thread even with the SR501 lens it seems to have similar problem than the am312: some "blind" areas where it doesn't detect movement. It can use 2*AA or CR123 for PIR. At least for my lens, the holes are too narrow and I can't fit them in. I'll try boring bigger holes with a drill. If you want, I'll look up for you the hole diameter that I used on my primitive breakout board, because it fit just right (by pure luck I'm sure). I'm still waiting to receive my AM612's, so nothing more I can really do right now. When you upload the .brd file OSH park will take all layers in it and export them, including the name layer and it will mix up with the additional info I added. It's the same problem with the NModule board. Regarding the holes it's strange because on my board I have the spacing a bit wrong but the holes are big enough. And I don't remember changing hole size when I fixed the spacing. 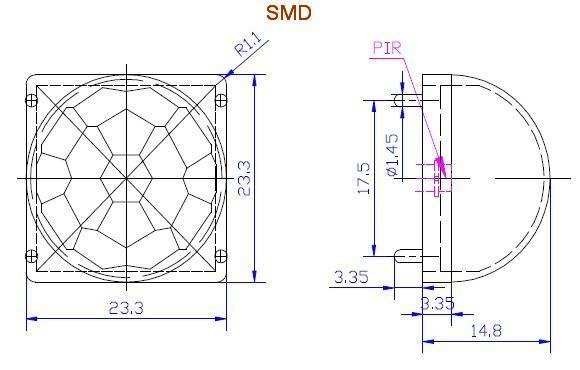 I'll increase the size anyway as I see on the "datasheet" picture I posted in the other thread that the feet are supposed to be 1.45mm and my holes are only 1.2... Probably my lenses are not really matching the standard. FWIW, I used 1.55mm holes. There may be no perfect diameter since we don't even know for sure yet which lens will turn out best.